This update was included in v2.70+ of the Zero BS CRM Core, and with it comes a 20x+ improvement in page-load times and contact operations. This guide will walk you through the steps of this essential database migration. Before you get started, it is essential you backup your database. This process will mean that your Contact ID’s change. The system remembers old ID’s and can expose these if you need them. Please let us know via support if this is an issue for your business workflow. You BACKUP your database before you run the routine – it’s been very well tested, but we’re not responsible for your loss of data if you do not back up before you run this! Please allow time. A 2k contact database may take 3-5 minutes, depending on your server hardware. A 10k list might therefore take 25 minutes+. Please leave the page open until the ‘Complete’ page shows (below). … it’s imperative you take these seriously, but once you understand them – and agree – hit the green ‘I have backed up my database, Begin’ button. Once you get going, you’ll see a page like this (part completed) – this page will automatically start workers which will process 5 contacts at a time. This backs your data up as it goes, as well as migrating all ‘old database objects’ into new (and improved) DB2 objects. The progress bar will go up as it works, and you can pause this with the ‘Pause’ button (but please try to run it in one sitting, especially if you’re using API/Sync extensions). This means you’re all set! Your ZBS CRM has successfully upgraded your database. Win. 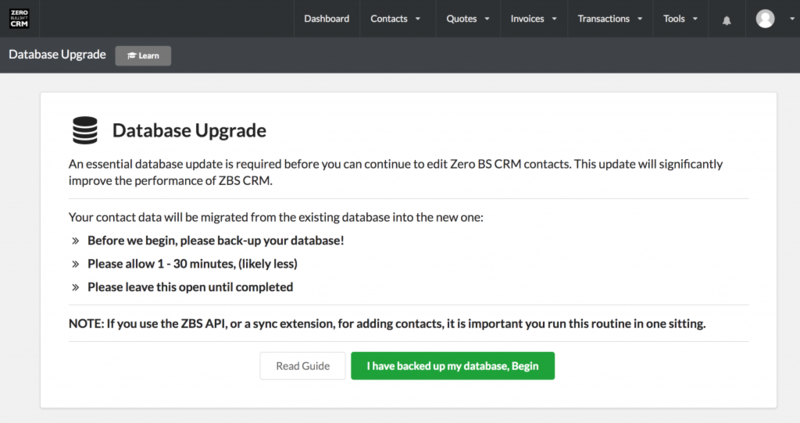 Now your contact lists will be faster, your contact edits will be cleaner, and lots more awesomeness is on the way (we needed these database updates to enable future features in extensions like Mail Campaigns for CRM). It’s highly recommended that if you’re a CRM extension user (bundle owner?) that you update ALL of your extensions now – only the latest versions will properly support DB2 functionality.